New media article: Opinion: Why is the Ports Modernization Review not transparent? Ottawa: The Hill Times, Monday February 25, 2019, p. 28. Not a subscriber? Click here for the text. Recent presentations in Belgium: One was to the Federation of European Private Port Companies and Terminals (FEPORT) Annual Stakeholders Conference, in Brussels on November 29 and the other a public lecture at the University of Antwerp. Both are available for download from the Speeches and Webinar’s tab. Recent Project Now Published: UNCTAD’s Review of Maritime Transport is 50 this year. 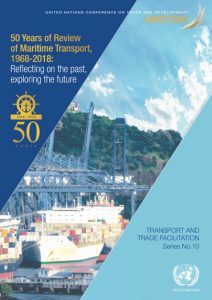 To mark the 50th anniversary, UNCTAD published an RMT50 Special Issue, 50 Years of Review of Maritime Transport, 1968-2018: Reflecting on the past, exploring the future. It showcases UNCTAD RMT research, analysis and data with interesting and diverse perspectives, over the past, the present and the future. MRBTC assisted UNCTAD in developing this publication by providing content (Chapter 4), and editorial support. It was released November 23rd, and Hellenic Shipping completed an excellent overview of the publication in its December 12th issue. Significant honour: Winner of the Onassis Prize in Shipping 2018. Announced on April 20th by the City University of London, Mary R. Brooks wins the Onassis Prize in Shipping 2018. The Shipping Prize was shared with Professor Wayne Talley. Three Onassis Prizes—in the fields of finance, international trade and shipping, the disciplines in which Aristotle Onassis excelled—recognize the lifetime achievement of experienced academics. Download the official Press Release. Dalhousie University has also written an excellent article in Dal News on it. The story was also covered by Modern Diplomacy. I am so honoured to have been chosen as one of two recipients of the 2018 Onassis Prize in Shipping. To be the second Canadian, and the first woman, to be awarded this most prestigious prize accorded to academics in the field makes it even more of an honour. I grew up in a small town in Nova Scotia, a province where shipping was critical to its history and economy, but I did not know then how important the industry was to global prosperity. No great journey of discovery is ever completed alone, and my success is shared with all the colleagues and mentors who worked with me over the years. Published late September: The Future of Ocean Governance and Capacity Development: Essays in Honour of Elisabeth Mann Borgese (1918‐2002), edited by the International Ocean Institute Canada. Essays by more than 80 experts including eight on marine transportation, edited by Mary R. Brooks. If you want to know more about this remarkable woman, click here. My transportation practice focuses on understanding my clients’ needs and helping them create value for those they serve. This may range from conducting credible research, acting as an expert witness, seeking answers to “too hard” questions, running a focus group or providing corporate education in the transportation management and international marketing fields. As an educator, I delight in helping companies bring staff skills in middle and senior management to a higher level of critical thinking. My research and consulting work focuses on transportation and global supply chain management, and I am particularly interested in the relationships between the buyers and sellers of transportation services. With a keen interest in how to make Canadian supply chains better, and enthusiasm for the world of shipping and ports, I founded the Port Performance Research Network in 2001 to examine how to make ports more effective in adding value to their users’ supply chains through governance reform and benchmarking. That network has gone viral, with 60 scholars around the globe. Since 2003, I also have had an active research program in the area of short sea shipping, as I believe that we need to move as much cargo by sea as possible in order to do our part to mitigate climate change impacts from goods movement. Encouraging modal switching and convincing ports to care about creating value for customers have become my wicked challenges.